My husband and I, having just moved to the Greenville area, couldn’t help but notice just how up and coming it is. (And after living here for almost a year now, we can see why)! Because of this, we decided to buy an older, run-down home near the downtown area that we could renovate and make “our own.” And with Greenville on the rise, we knew this would make for a good long-term investment. After narrowing it down to 3 contractors and meeting with each of them separately, we went with the one who seemed to understand our vision the clearest. (However, I won’t mention them here- you’ll understand why in just a moment). Overall, we were happy with our decision and within 8 months (only 2 off from our original finish date), we were fully moved in and settled into our new, beautiful home. All was good until one day I came home to find both of our new wall-hung flat screens missing! I checked around the house for any sign of breaking and entering but didn’t find any. I knew I’d had to unlock the back door to get in and the front door was both locked and dead bolted. Next, of course was to check all of the windows, all of which were latched and closed securely. Having made only 3 sets of keys, one for me, one for my husband and one for the contractor and his team, (which we didn’t even think to ask them to return — tactical error), we were able to narrow down the suspected culprit quickly. I called our contractor and of course, he assured us he knew nothing about any of this and that he and his team were all trustworthy. Without any proof, we couldn’t press charges, nor do I feel comfortable exposing them on a public blog. But you can believe we decided to change all the locks. I didn’t want to delay this process at all as we now felt somewhat unsafe in our new home. Now having several connections in the area, we were referred to Greenville Lock which is a local, family owned company. After a little extra searching, we decided to give them a go and were very happy we did! Everyone we encountered at Greenville Lock was pleasant and incredibly efficient. Within minutes of submitting our information online, we heard back from them and our quote which was actually cheaper than we were anticipating. Plus, on top of that, we got an extra 10% off as first time customers. Bonus! They were very accommodating when setting a time that would work for us and were able to complete the job in no time. We now feel completely secure in our home again and have Greenville Lock and their wonderful staff to thank! So if ever you find yourself in need of a locksmith in Greenville, SC , I would highly recommend Greenville Lock. Now that my husband and I know the Greenville area pretty well, particularly downtown as we’re close by, we have a handful of restaurants where we’re known by name. There’s one in particular I’ll be introducing you to today which is nowhere near downtown. But boy, it’s worth the drive! The Lost Cajun, (off of the Pelham Rd exit from I-85- about a 20 minute drive from downtown), is not only one of our favorite restaurants in Greenville but also one of the best Cajun restaurants we’ve been to outside of Louisiana. Everything on the menu is delicious. I know this because I’ve tried everything! Now, you may be thinking, “Wow, she really is a regular!” …Which I am. But you don’t have to be in order to get a taste of all their food. 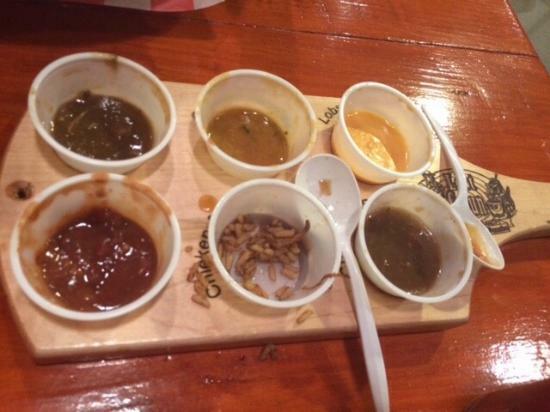 This is because you’re brought a sample platter with 6 of their most popular items as soon as you sit down. This was an amazing surprise our first visit. And an even better surprise when they brought it to us again several visits later, knowing we’d already had it before! Their menu is very well-priced, giving you an option of [large] cup or [large] bowl for everything but their po’ boys. Which are also true to Louisiana! As good as everything is, (my favorite is the red beans and rice– how is something so simple SO flavorful?!) we’re always sure to save room for desert: Beignets and chicory cafe au lait. 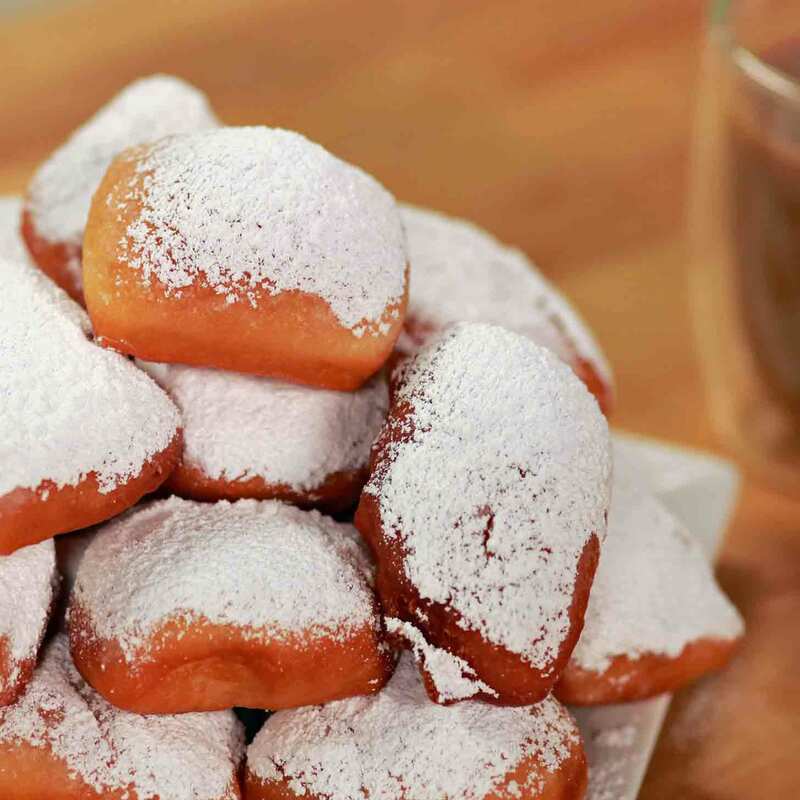 For those of you who don’t know, a beignet is a typical Louisiana desert that is much like funnel cake; fried dough covered with powdered sugar. Yum! Always good service and always a good time. If you’re in the mood for some good, authentic Cajun food in Greenville, The Lost Cajun is definitely a place to try. (Tell our favorite waiter, Joe, I say hello)!